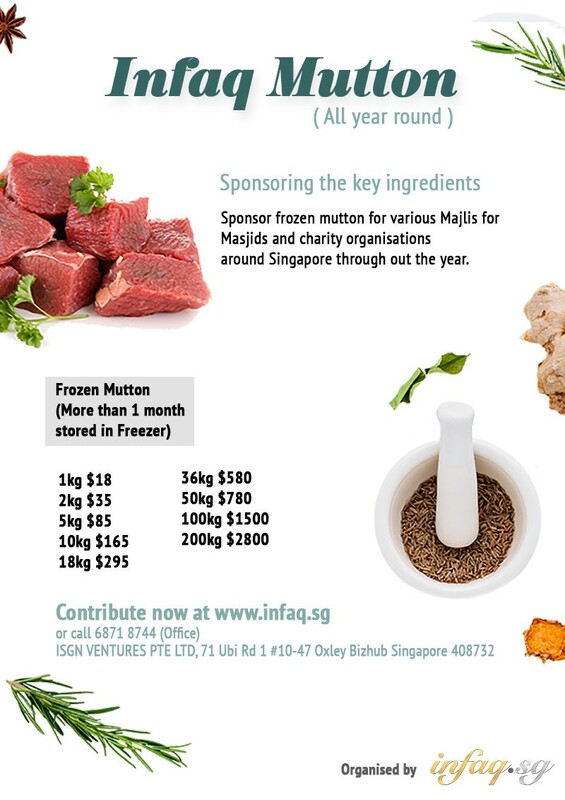 Mission: To support mosques and Muslim organisations by providing halal mutton for their events / majlis. Throughout the year we have had requests from various organisations for sponsorship of mutton, and often we have to reject them because we could only raise funds only during certain periods like Ramadan, or when we have Aqiqah Australia projects, where we were able to bring in the mutton from Australia. To make this effort more sustainable and for us to be able to respond to requests, we have decided to run this project all year around. This would also provide avenues for the community to continue supporting various events throughout the year. For Infaq Mutton ( All year round ), we will only raise funds for Frozen Mutton, as it is easier to acquire and cheaper to purchase compared to Fresh Meat. Prices above will include butcher's cuts and delivery to beneficiaries. Banking and transaction fees are also included. Sponsors will receive reports of events: total collection and distribution. * You are required to register your details on the right. Details of cheque payment / bank transfer will be sent to you via email.